Home > Baby Deals > Costco Coupon: $5 off Housebrand Diapers = Stock up Prices! Costco Coupon: $5 off Housebrand Diapers = Stock up Prices! Today is a great day to get stock up prices on diapers without cutting a coupon or even leaving the house!! 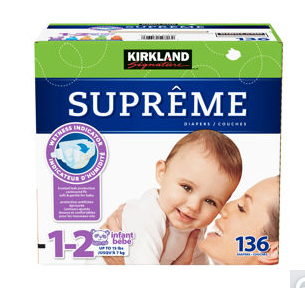 Costco is offering $5 off their housebrand diapers, Kirkland Signature, plus they are giving FREE shipping on any order! While the counts per box go down the larger the size, these are still hitting our stock up price on diapers. They are actually beating the price on the larger sizes! If you aren’t a member you’ll pay a surcharge of 5%. For me it was only 75¢ on the small box or $1.70 on the large box. I’ll gladly pay the $1.70 to grab the deal and not have to get a membership! Getting the size 1-2 box it is basically like getting a jumbo pack for $4 each even after the surcharge. The sale ends 10/27 or while supplies last.